Over 6 weeks ago I started an $8,000.00 dollar CHRISTMAS GIVE-AWAY Contest. So, today I gave away $14,500.00 in CASH AND PRIZES. This has definitely made this one of the most exciting Christmases I have ever had. I wish all of you and all of your families, the Merriest Christmas and the most Prosperous New Year in "2009". PS: Watch the Video to see all the drawings; the excitement and the winners. Click the play arrow to watch the video. Nail Technicians ALERT: Stay where you are! Do not get restless and think that another career, trade or job is going to be better than what you already have right now. The Beauty Business is exactly where you need to be. Every one of us can have beautiful nails in less than 1 hour. This makes our business very unique, because we can take "ugly" nails and make them "beautiful" nails, with no effort from the Client. All the Client has to do is sit and relax, and enjoy herself. She will instantly feel prettier and happier even on a bad day. When you have a trade or a special skill, you are usually an independent contractor; which means you set your own hours, and decide your own paycheck; and you don’t have to worry about getting "fired" or "laid-off". Nails is the best career to be in right now, especially for working mom’s, because you can make your own schedule and get paid every day. Being a Nail Technician is a special skill, just like being an Electrician, Chiropractor, Mechanic, or a Seamstress. You will always have this skill, so you can always make money. Anytime you specialize in something that you do with your hands that takes expertise: you will make money, no matter what kind of an economy we have. Having a trade or a skill is more secure than just a job, because not everyone can do it, unless they have been trained and licensed. So, the best career for you right now is the one you are in: Doing Nails! Don’t look around and get off track, settle in and get after it. "Clients' activities different times of the year and clients' physical chemistry or medications can affect what type of nail liquid to use." "I have designed 5 different nail liquids for you to choose rom. Each Nail Technician has different needs while doing acrylic nails. Some like a fast setting liquid; some like a slower setting liquid; some like a non-yellowing liquid and some like extra adhesion. Sometimes even the temperature in your area at different times of the year; clients' activities different times of the year and clients' physical chemistry or medications can affect what type of nail liquid to use. I have put together an explanation of each of these nail liquids, characteristics and qualities so it will be easy for you to choose the Tammy Taylor Nail Liquid that fits your needs and your clients needs." year round with no crystallizing in the winter. The Tammy Taylor "A+" Nail Liquid is designed to keep your "white’s whiter" and your "pinks brighter". The Tammy Taylor "Xtra-Adhesion" Nail Liquid was designed especially for clients with special acrylic nail needs. Some clients have fingernails that are difficult for acrylic to adhere to and need an extra boost in the nail liquid to help adhesion and eliminate lifting. The Tammy Taylor "(S-Set)" Nail Liquid (aka) Summer Nail Liquid is a slower setting nail liquid, designed originally for summertime or hot weather, but also works great year round. That is why it will be re-named (S-Set) Slower Setting Nail Liquid instead of Summer; so there will be no confusion for those who want a slower setting nail liquid in all types of weather. Tammy Taylor "Odor-less" Nail Liquid was designed especially for State Board examinations and Nail Schools that cannot have any odor. This liquid can be used with Tammy Taylor Prizma Powders, Tammy Taylor Original Nail Powders and Tammy Taylor Odor-less Nail Powders. Do not use with Tammy Taylor (S-Set) Nail Powder (aka) Summer Nail Powder. "Even When you have been in Business over 50 years like Saks Fifth Ave and Nordstroms, you still need to Run Specials and keep on top of your business." Saks Fifth Avenue and Nordstrom’s run specials to encourage new clients and regular clients, to come to their stores. 15 years and you think running Specials is embarrassing, or that clients might think, "I wonder why she is running Specials?" Clients are not thinking anything except “This is Great; I saved a little money on my fingernails, so now I can also afford to get my toenails done”. Saks Fifth Avenue and Nordstrom’s have been in business over 50 years and they aren't embarrassed to run specials, they thrive on it. But, these stores only do their big sales 3-4 times a year. So, do not run your big Specials 365 days a year, Only do the big Specials 3-4 times a year. And you need a referral program for your regular clients who refer you new clients 365 days a year. your business fresh and growing. Always encourage new clients, because for every 1 good client that stops coming in, you will need 3 new clients to replace that one good client. Not every “new” client turns into a good regular client; so you need at least 3 new clients to get 1 good client. The Salons are now busier and the nail business is back on track, so let's keep it going, stop worrying and start promoting. "You need to have a great nail powder to do great nails." "You need to have a great nail powder to do great nails that keep your clients coming back. All of my nail powders look and feel very natural. When I started doing nails, all we had was clear or a light white color that was used on the entire fingernail and covered with color nail polish. I did not like to wear polish when I did nails because it was too messy, so I created Pink & White Powders that looked like a French Manicure but did not get messy when doing nails. The clients went crazy for my signature Tammy Taylor Pink & White look and the rest is history." Tammy Taylor Nail Powders have been developed to perform under every circumstance for every client and for every Nail Technician. Tammy Taylor nail powders have been the most talked about nail powders in the nail industry for over 20 years. 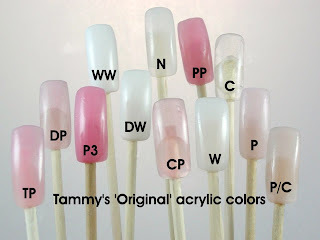 Tammy Taylor personally tests every single batch for performance, color, clarity and consistency before it is filled into jars for Nail Technicians. Tammy Taylor Nail Powders are made in the U.S.A.
Tammy Taylor Nail Powders can be shaped while drying and they have been developed to cure gradually as they set up. This gives you time to shape the famous Tammy Taylor C-Curve into your acrylic nails before it gets hard, giving your acrylic nails that beautiful natural looking, slender, curved and strong nail that keeps your clients coming back. Tammy Taylor Nail Powders are available in 2 different work-abilities for your acrylic nail application style. The ORIGINAL NAIL POWDER is FAST SETTING. The (S-SET) Summer NAIL POWDER is SLOWER SETTING. Both the Original and (S-Set) Summer Nail Powders have all the outstanding colors, features and qualities you have come to know and trust. 12 Beautiful Tammy Taylor NAIL POWDER COLORS to choose from. Competitive Edge Whitest-White - (CEWW, not shown) Dries slower and gives more time to create the smile-line. Good for anyone having problems with their white drying too fast on the free-edge. Great for Competitions. All of the Pink powders and the White powders look beautiful together; to make Pink & White acrylic nails. Clear powder - a multi-purpose powder used alone or with original powders; and as an overlay for Prizma. Professionals: "FREE TAMMY TAYLOR NAIL POWDER OF YOUR CHOICE" 12 Beautiful Tammy Taylor NAIL POWDER COLORS for you to choose from. This is the Greatest News we could have as Nail Technicians: The 2008 Black Friday retail sales were up 3% over 2007. Why is this Great News for us? Because theseShoppers are our Clients, and they are out spending money, "YAY"! And, when they are spending money, they are also spending money on NAILS, "YAY". So, things are shaping up, and we are going to have a Great Holiday Season. I was at Macys on Sunday and I asked the Sales Clerk how the Holiday shopping was going, and he said it has been non-stop shoppers, and their store did $60,000 more this Black Friday than last years Black Friday. He said people had been shopping and spending all weekend, and their corporate headquarters is thrilled. I asked every Store I went into, and they all said the entire weekend had been crazy busy and sells were up. And, the one thing I did notice more than EVER before, was the customer service was outstanding everywhere I went. Every store had extra people working so you could ask for help, find things fast, and get checked out fast. I have never been treated better and had more fun Shopping, than I did last weekend. It made me want to Shop every DAY, SO I DID! Customer Service, Customer Service, Customer Service; I cannot say it enough. Customer Service is the backbone of every business. The next 3 weeks is your time to Shine with excellent Customer Service. Impress your new clients and your regular clients, by going above and beyond, to make them feel special. Here are a couple of NAIL TIPS to insure your Clients come back to your Salon after the Holiday Season. Make sure every single client has at least 5 of your business cards in their purse. And, tell them if they get you 3 new clients in the next 2 months, They will receive a FREE Pedicure. 25% off one service of their choice in February. "Let's Kick Start 2009 by Increasing the amount of NEW Holiday clients that get their nails done. Make sure not to say no to one single client over the next 3 weeks; fit in every single person that wants their nails done, even if it means adding extra days or hours. The Holidays are the best time of year to pick up an extra 10 or more clients that turn into Regulars. This is only for 3 weeks and it will help insure a Great Start to 2009."